Gear4 launches StreetParty 5 iPod dock with Apple Lightning connector | What Hi-Fi? Apple Lightning docks remain thin on the ground, leaving you without many options if you still want to play your tunes and charge your iPhone 5, latest-gen iPod Touch or iPod Nano with one simple speaker dock. Gear4 has stepped in to the breach with the release of the StreetParty 5, an Apple Lightning dock. 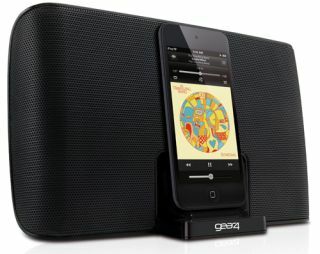 Gear4's StreetParty range of docks have been some of the biggest-selling iPod docks on the market, and this model replaces the massively successful StreetParty 3 speaker. The combination of a portable battery-powered dock and a knockdown price tag looks likely to tempt people once more, with the StreetParty 5 running off mains power or 4 x AA batteries and costing just £50. Thanks to the option of battery power and the ability to fold the dock up, the StreetParty 5 is certainly nice and portable. It will of course play all your tunes from your iPhone and also charge your device. If you want to use older generation iPod docks with the latest iDevices you have to use the Apple Lightning to 30-pin adapter. This Lightning dock joins the JBL OnBeat Micro, Venue LT and OnBeat Rumble as the first speaker docks to hit the market with the new Apple Lightning connector. The Gear4 StreetParty 5 is available for purchase now at an RRP of £50.